Happy (almost) St. Patrick's Day dolls! Get our your four leaf clovers, lucky charms and, most importantly, get ready to deck yourself out in your favorite shade of green this Saturday. While we're both partial to wearing a bright and vibrant kelly green, a subtle mint green should do the trick and keep you from getting heckled (or pinched!) during the day's festivities. And lucky for you, green is a big color this Spring, so you'll be sure to get a lot of wear out of your selection. 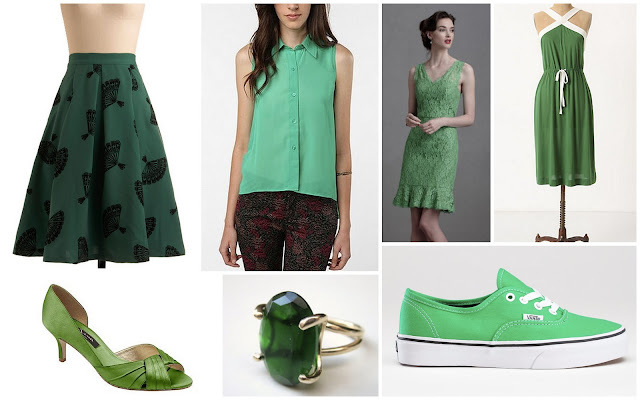 Here is some inspiration that will have your friends going green with envy! 1. Modcloth | 2. Urban Outfitters | 3. BHLDN | 4. Anthropologie | 5. Macy's | 6. Anemone Jewelry | 7. Oooh I love the blouse from urban outfitters and I am a huge fan of the Vans...love the tennis green.